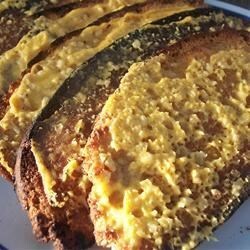 "French bread (or Italian) is lightly toasted, spread with a creamy cheese mixture and grilled until warm, melted, and unbelievably delicious. The finished bread keeps well in an airtight container." In a medium bowl, mix the mayonnaise, garlic, and Parmesan cheese. In a saucepan over medium-low heat, mix the Cheddar cheese, half-and-half, and paprika. Stir constantly until melted and smooth. Pour into the bowl with mayonnaise mixture, stirring until well blended. Place the French bread on the grill cut side down, and let it toast for a few minutes. Remove from the grill, and spread the cheese mixture on each side. Place the halves back together, and wrap the loaf in aluminum foil. Return to the grill for about 15 minutes, turning occasionally, until the loaf is heated through and the cheese mixture is hot. This is good but itisn't worth the extra fat, calories and cholesterol. Try using olive oil and minced garlic only for great flavor and fewer fat grams. This had great flavor, but it needs to be turned occasionally while on the grill to avoid burning. This recipe was great! I used a large loaf of French bread and thought the amount of filling was just right. I also just baked the bread in the oven rather than putting it on the grill. This bread is AWESOME!!!! I make it often. I put it in the oven when I can't use the grill. My family really loves it with almost any meal.